Glucosamine & Turmeric with Vitamins A, C and E formulation could be the solution you have searched to find for your sore, aching and painful joints. 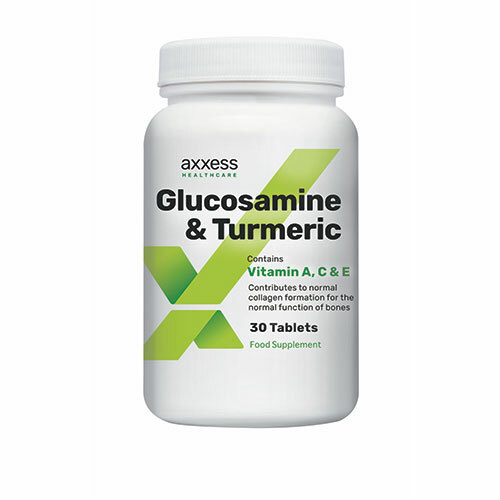 Glucosamine occurs naturally in the body, where it plays a vital role in making glycosaminoglycans and glycoproteins. As you age you require more glucosamine to provide the raw materials to manufacture these essential building blocks so you can maintain healthy joints, ligaments, tendons, cartilage and synovial fluid. Supporting these will help rejuvenate and restore your joints to a normal, pain free state; allowing you freer, pain free movement. Turmeric is part of the ginger family and has been used in cooking for centuries in Asia. It has also been a cornerstone of herbal medicine in Asia to combat joint pain and mobility problems. The active compound is Curcumin, which is widely known for its anti-inflammatory properties which makes it so effective against joint degeneration and in restoring pain free movement of your joints. Vitamins A,C and E assist in the normal formation of collagen – so helping to keep your bones strong and healthy. This potent formula comes as tablets or patches. Both provide pain free joint support for up to 24 hours. For stronger and faster results, you can use them in combination.